Pipeline – Cyfuse Biomedical K.K. Cyfuse utilizes its unique platform technology of three-dimensionally layered cells (Spheroid) to regenerate tissues and organs that malfunction because of disease or injury. We are aiming to contribute to save a number of patients in response to meet the unmet medical needs that were not satisfied by existing surgery or treatments. Transplantation of a cellular structure created from cells only into humans is a new treatment option as a breakthrough approach expected to be safe with high therapeutic effects. 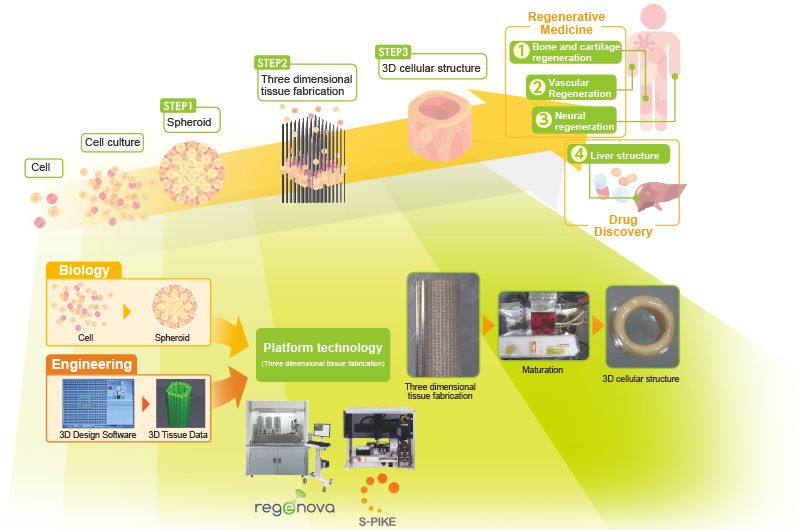 Cyfuse has been promoting the development for the regeneration of various tissues and organs, such as bone and cartilage, blood vessels, and nerves, by using its unique platform technology. At the same time, we are putting the technology into practical use as pathology models to clarify disease mechanisms, and as a drag screening tool to evaluate the efficacy, toxicity, and metabolism of new drugs. The pipelines in which Cyfuse actively develops, are based on unmet needs in medical settings and the cell products created by unique platform technology of Cyfuse is expected to be used in actual medical settings in the future.